September 25 is the birthday of Annie Mable McDaniel Abrams. Miss Annie or Mother Abrams or Mrs. Abrams. Whatever you call her, she greets you with a smile, a hug, and sage advice. As both a historian and a futurist, she has turned her house into a museum and library. As a writer and preservationist, she has worked to document history and ensure historical properties and neighborhoods will long remain in Little Rock. Born in Arkadelphia, she moved to Little Rock at age 13 to attend Dunbar Junior High School and High School. She studied education at Dunbar Junior College and later taught in Marianna. In 1956, she returned to Little Rock to work for the Arkansas Teachers Association. After her return to the capital city, she married Orville Abrams. In addition to raising her four children, Miss Annie has helped raise countless others through her advice, support, love, and sometimes strong admonitions. She also found time to return to school and receive a degree from Philander Smith College. Among her many accomplishments are leading efforts to rename High Street for Martin Luther King, 14th Street for Daisy L. Gatson Bates and 20th Street for Charles Bussey. Through her community activities, she had worked closely with both Bates and Bussey. She was a friend to the Little Rock Nine (who were only a few years younger than she) and to their families. Perhaps, because she has been a personal friend of many Arkansas and national politicians over the past 60 years, it should come as no surprise that she and her husband were also acquainted with Governor Faubus. In recognition of all her efforts she has been recognized with an honorary doctorate from Philander Smith College, the Brooks Hays Award, and an award award from the national Martin Luther King Jr. Commission. In 2010, she was inducted into the Arkansas Black Hall of Fame. Annie Mable McDaniel Abrams is a retired educator by trade and civic activist by avocation. She is included in this list because she is also a historian. As a writer and preservationist, she has worked to document history and ensure historical properties and neighborhoods will long remain in Little Rock. Whether a leading political figure or a small child, Miss Annie isn’t afraid to give advice or to share her love. Once an educator, always an educator, she loves to learn and teach. It is rare for her to miss a speech at the Clinton School or a Political Animals Club meeting. For more on Annie Abrams and other inductees into the Arkansas Black Hall of Fame, visit the permanent exhibit at the Mosaic Templars Cultural Center. That museum is an agency of the Department of Arkansas Heritage. Sue Cowan Williams was an educator who fought for fair treatment. After being educated in Alabama and Illinois, she returned to Arkansas, and began her teaching career in 1935 at Dunbar High School in Little Rock. In 1942, Williams became the plaintiff in a lawsuit aimed at equalizing the salaries of black and white teachers in the Little Rock School District. The NAACP’s Legal Defense Fund, including its director-counsel Thurgood Marshall, assisted in the case. The trial ended after a week with a verdict against Williams, and her teaching contract was not renewed for the 1942-43 school year. Other black educators left the school as a result of their involvement in the lawsuit. In 1945, Williams successfully appealed the verdict to the Eighth Circuit Court of Appeal in St. Louis, which ordered equal pay for black and white teachers in Little Rock. Dr. Christophe, the new principal of Dunbar High School, demanded Williams’s reinstatement in the fall of the same year, but it was not granted until 1952. In the intervening years, she taught classes at what is now UAPB and Arkansas Baptist College as well as at the Ordnance Plant in Jacksonville. Upon returning to the LRSD, Williams taught at Dunbar until 1974, when she retired. She died in 1994. The Central Arkansas Library Branch located in the Dunbar neighborhood was named for her when it opened in 1997. She is honored with inclusion in the Arkansas Civil Rights Heritage Trail. The Paul Laurence Dunbar School Historic District played an important role as the center of Little Rock’s African American community from the mid-1800s to the mid-1900s. Development began around Wesley Chapel, organized in 1853. The neighborhood expanded after the Civil War to become home to many African Americans noted for their success in a number of fields, including business, politics, religion, education, law, music, and medicine. Among the historically black institutions that were founded in the neighborhood and remain there today are several churches, including Wesley Chapel United Methodist, Bethel A.M.E., Mount Pleasant Baptist, Mount Zion Baptist, and Union A.M.E.; and two colleges, Arkansas Baptist and Philander Smith. The existing Dunbar School replaced an older high school that was named for Mifflin Gibbs, a prominent African American lawyer and political leader who lived in the neighborhood. Today, Gibbs Elementary School continues the recognition of Gibbs. 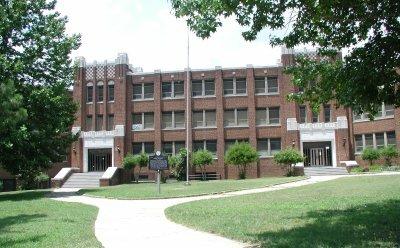 After Little Rock High School (now Central High School) was completed in 1927, the building of Paul Laurence Dunbar High School was completed in 1929. Money came from the Rosenwald Fund, founded by Julius Rosenwald, president of Sears, Roebuck and Company, and from local black residents. Local blacks insisted on adding college preparatory classes to the vocational-industrial ones that were offered in black schools at the time. The building, modeled after the white high school, housed grades seven through twelve plus a junior college. Black students came from all over Arkansas to take advantage of its educational opportunities. When Horace Mann High School opened as a segregated school in 1956, Dunbar became a junior high school. A Dunbar-Mann Alumni Association, whose members live throughout the country, still helps to support both schools. In the 1930s, Charlotte Andrews Stephens, the first black public school teacher in Little Rock, was on the faculty at Dunbar, completing seventy years of teaching with the district. In the 1940s, Sue Cowan Williams, English Department chair, lost her job when she sued the Little Rock School District for equal pay for black and white teachers. Now known as Dunbar Middle School, this building originally house students from junior high to junior college. For years the Paul Laurence Dunbar High School was known throughout Arkansas and the south as an outstanding school for African American students. From 1929 until 1955, Dunbar High School provided a high-quality education for African American students, not only within Little Rock but also from far-reaching corners of the state. Today the National Dunbar Alumni Association is a well-organized network of former students with active chapters throughout the United States. The school is located in a residential area south of downtown Little Rock. George H. Wittenburg and Lawson L. Delony designed the edifice, built on a southeast-northwest axis. Both architects contributed to the design of Little Rock Central High School (1927; listed on the National Register in 1977), which is nine blocks west of Dunbar. Dunbar was designed to accommodate an academic curriculum as well as the more traditional vocational programs often considered the limit of education for blacks. In 1980, Dunbar Junior and Senior High School and Junior College was listed on the National Register. The significance of Dunbar Junior High School derives both from the unique place it occupies in the history of education in Arkansas and from the modern architectural concepts with which it was designed. Dunbar was a center of quality education for black Arkansans in the state’s segregated public school system, functioning as a junior high school, high school, and junior college until its last high-school and junior-college classes graduated in 1955. The architects’ achievement in designing an architecturally eminent setting for this progressive passage in Arkansas history is also noteworthy. With an eye toward form following function, the plan of the building promotes maximum use of space and expedient circulation. Aesthetically, the building is decidedly modern, with decorative brick and stone work and striking towers reflecting an interest in the Art Deco style of the period.